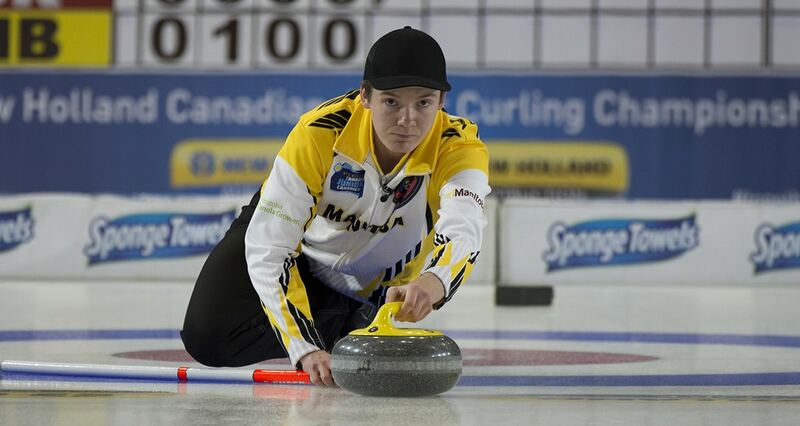 Manitoba’s dominance on the national junior men’s curling stage continues at the 2019 New Holland Canadian Juniors. Skips such as Matt Dunstone and Braden Calvert have collected numerous junior gold medals over the last six years and now JT Ryan will get the chance the make carve his own path after clinching his first appearance in the national junior men’s gold-medal game on Saturday night. Ryan, in his third-consecutive appearance for Manitoba at the national event, defeated Saskatchewan’s Rylan Kleiter (Sutherland Curling Club, Saskatoon) 9-3 in the men’s semifinal at the Art Hauser Centre in Prince Albert, Sask. Manitoba took advantage of the hammer in the seventh end to score three and began pulling away with the victory. 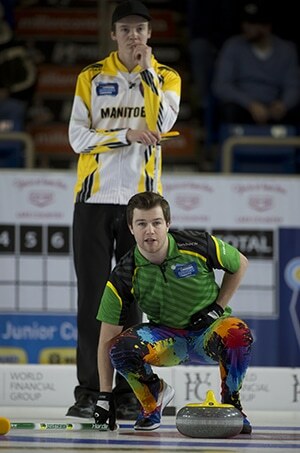 Saskatchewan’s final hit attempt through a small port racked on a guard which allowed Ryan an opportunity to guide his stone – relatively untouched by the sweepers – into the four-foot. Manitoba took a 5-1 lead heading into the eighth end and didn’t look back. It’s been a natural progression for Ryan who advanced to a tiebreaker in 2017, the semifinal in 2018 and now the final in 2019. The win launches Ryan and his Assiniboine Memorial Curling Club (Winnipeg) team of vice-skip Jacques Gauthier, second Jordan Peters, lead Cole Chandler and coach John Lund into the final against British Columbia’s Tyler Tardi of the Langley and Victoria Curling Clubs on Sunday at 3 p.m. (all times Central). 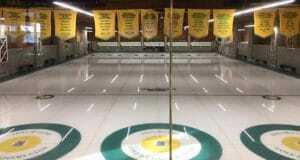 Manitoba defeated B.C. 7-4 in the Championship Pool game, but Ryan is expecting Tardi, the two-time defending national and reigning world champion, to come out strong. “He’s probably not going to miss a lot tomorrow, so that means we’re going to have to do the same thing. Even though we do have experience playing games like this, nothing this big. And Tyler’s been there, done that. Guy’s a world champ so we’re going to have to control our nerves and make a couple shots,” Ryan said. After giving up three in the seventh end, Kleiter, vice-skip Trevor Johnson, second Joshua Mattern, lead Matthieu Taillon and coach Dean Kleiter got the crowd back into it in the eighth with a triple raise takeout to score two. But Manitoba responded with four in the ninth to end the game. 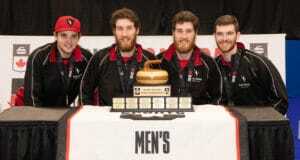 Manitoba has won four of the last six national junior men’s title, including two by Dunstone (2013, ’16) and two by Calvert (2014, ’15). Of those appearances at the world juniors, Canada collected gold in 2015 and bronze in ’13 and ’16. Ryan played against the accomplished skips through most of his junior career, and he credits that to his progression as a junior curler. Of course, the only two national men’s titles Manitoba hasn’t won over that six-year span has been the last two which Tardi has won. The British Columbia skip is seeking an unprecedented three junior titles in a row. 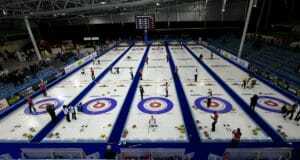 But first the undefeated Alberta women’s team skipped by Selena Sturmay of the Saville Community Sports Centre in Edmonton will play for gold against British Columbia’s Sarah Daniels of the Delta Thistle Curling Club in North Delta. Alberta clinched its spot in the final by finishing first overall in the Championship Pool while British Columbia played through a tiebreaker and semifinal game to advance to the final. The women’s gold medal game will begin at 10 a.m.